Vassilis, 52, has worked for the National Book Center of Greece for a few years. He has been fired in view of the closing down of one of the few State subsidised culture entities. 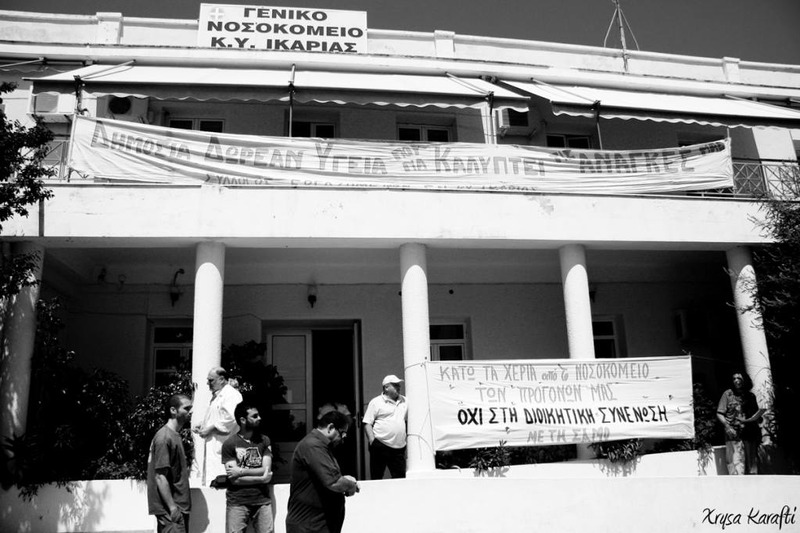 According to the Centre’s employee’s letter to the Ministry the institute organizes book festivals both in Greece and abroad, promotes readership, oversees and promotes the translation of Greek books through the Frasis project, runs book clubs, young writers’festivals, readers’awards, keeps archives of writers, publishers, libraries. In a country where reading is not promoted or facilitated, where every Municipality is struggling to organize its own library, where public lending libraries are extremely rare, dismantling such a tool equals a heavy blow to continuous education. There have been accusations of mismanagement of the funds allocated to the Center but I wonder whether terminating its existence is the right answer. Unless the government admits that it cannot control the operation of the institution. The 35 music schools which provide the only free musical education to high school students suffered a heavy blow a few months ago when the free transport provided was abolished. In the 3 million plus capital there are three music high schools. Students find it extremely difficult and expensive to travel on their own to their school so free public transport was provided. After the banning of this service there was a rumour that they are going to close down. Parents, students and teachers protested in Syntagma Square against such a move but their efforts go unheeded. YES TO THE REESTABLISHMENT OF AN INDEPENENT MINISTRY OF CULTURE! The Association of Greek Archaeologists strongly objects to the drastic cuts in culture funding for 2013. 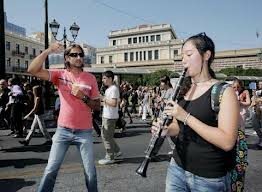 In the budget passed by the Greek Parliament, culture funding has fallen from €317,152,576 in 2012 to €250,100,000 for 2013. It should be noted that this fall includes a €34,000,000 reduction in wage costs(from €188,463,450 for 2012 to €154,651,000), which must raise serious concerns about the future of employees, given that the reduction cannot be fully accounted for forecast retirements. The diminished budget brings us one step closer to the completeundermining of culture, a process which was set in motion by the downgrading of the former Ministry of Culture to a General Secretariat within a newly-integrated Ministry of Education, Religious Affairs, Culture and Sports. Coupled with the schedule dinstitutional reforms that will also shrink the staffing of all public entities, including the nation’s Ephorates ofAntiquities and Museums,the increasing cuts in funding force us to raise the alarm: in terms both of the preservation of our cultural heritage and of contemporary artistic creation, culture in Greece is now grievously undervalued; indeed, culture is being treated as surplus to requirements. In a crisis like the one we are now living through, it is more essential than ever to safeguard the social role of culture, and to ensure that it is offered to everyone as a public good. We cannot allow the economic crisis to develop into a moral and social crisis, too; into a crisis of culture. We demand the reinstitution of the Ministry of Cultureas a ministry in its own right. Only an independent body with its own budget can hope to safeguard the cultural heritage and historical memory of Greece, while simultaneously promoting contemporary creativity in the arts. Using the financial crisis as an excuse the present Greek government curbs all funds spent for cultural activities. The damage this will cause longterm is immeasurable and it will affect more than one generation of Greek children. Once again the government acts spasmodically trying to find money from the most vulnerable sectors, leaving out of the picture the “difficult” to chase tax evading professions and elites.